After came out from college, I never tried anything to improve my writing skills because of the spell check and grammar check tools available on the Internet. For a blog writer, if he knows how to use the spell checker, he does not need to worry too much about accidental spelling mistakes. However, after having a Firefox update, this feature just vanished. You can understand the difficulty to write without that tool. I know Firefox browser has default spell checker which will search for the spelling mistakes automatically. The last update just disabled that feature on my computer and I want to enable it back. 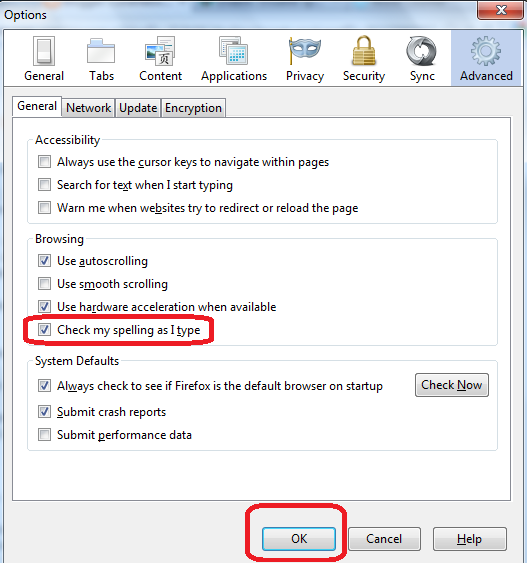 This tutorial guides you to turn on automatic spell check feature of Firefox browser. In latest versions, you must press [Alt] and [T] buttons together to start options menu. In general window, you can see a checkbox which says Check my spelling as I type. You must select the checkbox. After selecting the option Check my spelling as I type, Firefox will automatically display all the mistakes you made by highlighting them. So all you have to do it look for the highlighted words. You can simply right click on the highlighted words and select the correct word from the automatic list generated by the right. There might be a chance of showing an error for words which are not in the Mozilla dictionary. In that case, you can either use ignore or add to dictionary option to solve false error report. Some users do not like automatic assistance to fix errors they make while writing. If you are one among them, you can disable this feature. To disable automatic spell checker, you should follow steps 1 to 3 provided above. On this step, uncheck the checkbox near Check my spelling as I type and click OK. After this, Firefox will no longer look for spelling errors you have made.